This video slot aims to stand out from many of the other fairy-tale themed currently on the market. It does so quite well, with players probably unable to tell it is Captain Hook themed game, if not for its title. Hook’s Heroes is NetEnt's latest video slot, and one which offers a Re-imagining of the Peter Pan tale. The Hook’s Heroes slot machine focuses on Captain Hook’s crew, who are often overlooked in the story. Complete with decent features and stunning graphics, we’ll examine this new game a lot more closely in our Hook’s Heroes slot review, and attempt to get to the bottom of this 5-reel, 20-payline video slot. Hook’s Heroes has no faults, graphically. A madcap collection of pirates are all presented to you as characters in this game, each looking quite distinct from the others. 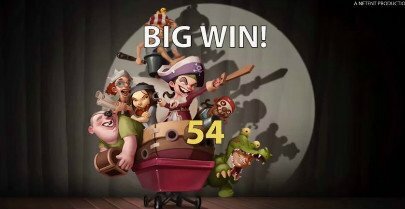 The pirates in this game are also far more menacing than in other pirate themed slots, making the Hook’s Heroes slot slightly more realistic than some of the more child-like Disney versions of the same crew. In terms of pay-outs, this slot carries a pay-rate of 96.82%, which is more than average. As we’ve mentioned, there are a total of 20 paylines featuring on 5 reels in this game. The Hook’s Heroes game allows players to alter the value of their coins from 0.01 up to 1.00 in total. Players will also be able to stake up to 10 of those coins per line, via the betting level button. Everything should be familiar to any player who has ever given a NetEnt slot a run for its money. It’s the same wagering menu bar which can be found in their other games. Players will be able to bet anything from a minimum of 0.20 per spin, up to a high of 200.00 per spin in this slot. Hook's Heroes slot looks like one of the better games that NetEnt has released this year, and the link to the classic story doesn't hurt either. Wilds symbols play an important part in the Hook’s Heroes slot. As one of the major Hook’s Heroes slot bonuses, you will want to take full advantage of them. Wilds appear in the game as pirates wearing hats. There are therefore multiple wilds present across the reels. As their name suggests, they can represent any other symbol in the game. The exception to this rule is the scatter icon. The wilds in the Hook’s Heroes slot may be basic, but they will get the job done. Scatter icons are represented by a pirate wearing a crocodile head. Scatter icons can offer players win multipliers against their total bet, when two or more appear in any positions on the reels. Three randomly triggered features appear in Hook’s Heroes. These can occur at any time, after any spin. The first is the Pirate Feature. With it, when a free spin is granted, a pirate will come swinging across the reels, and alter the symbols it hits with its sword. This will provide you with an almost assured win. The second bonus is the Mermaid Feature. When it is triggered, a free spin is granted and a mermaid will pop up to offer players a multiplier on their winnings, and an additional multiplier if they win with a wild during the spin. Finally, the Fairy Feature will see a “Tinkerbell-esque” critter hover over the symbols on the reels and turn random symbols into wild icons during a feature spin. 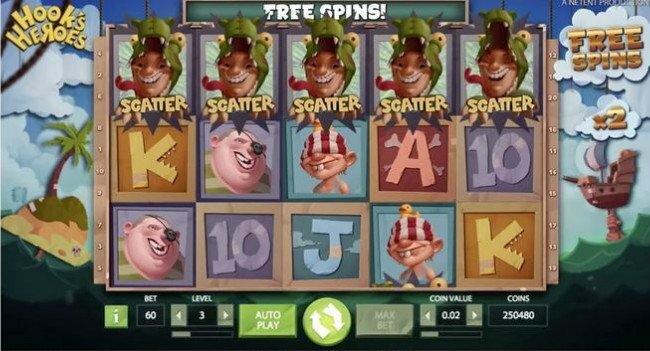 The Hook’s Heroes slot’s scatter icon can also trigger a free spins bonus game. 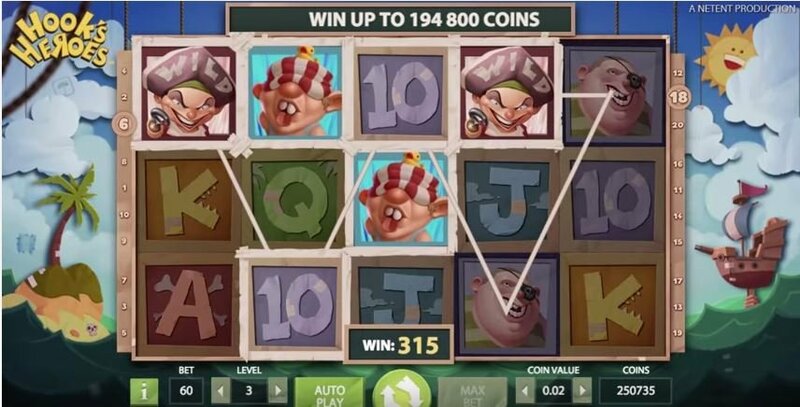 After landing 3 or more scatter icons in any position on the reels, the player will get to choose between 3 free spins features, from those listed above. The first is 10 free games with the Mermaid Feature. Alternatively, you might opt to go for the Pirate Feature, which offers 15 free games. Lastly, perhaps the Fairy Feature, with its 7 free spins is more your cup of tea? Either way, the choice is yours in the Hook’s Heroes slot machine. The Hook’s Heroes game is a cracking little slot. It offers a variety of solid free spins features, randomly triggered bonuses, as well as cheap bets. This video slot aims to stand out from many of the other fairy-tale themed currently on the market. It does so quite well, with players probably unable to tell it is Captain Hook themed game, if not for its title. An original video slot to say the least, Hook’s Heroes as all of the makings – and special features – of a genuine crowd pleaser, and most players will hurry to their favourite online casinos to play this title.